Pancreatic cancer is common and highly lethal and has a median age at diagnosis of 70 years. It is the fifth leading cause of cancer-related death in the Western World, second among gastrointestinal malignancies, surpassed only by colorectal cancer. Obstructive jaundice is a common presentation. Although the prognosis is generally dismal, surgery remains the only option for cure in those with a potentially resectable tumor. It is also an effective and durable palliative option in patients with good functional status and localized disease. Ultimately less than 20 % of patients with malignant distal biliary obstruction are candidates for surgical cure. 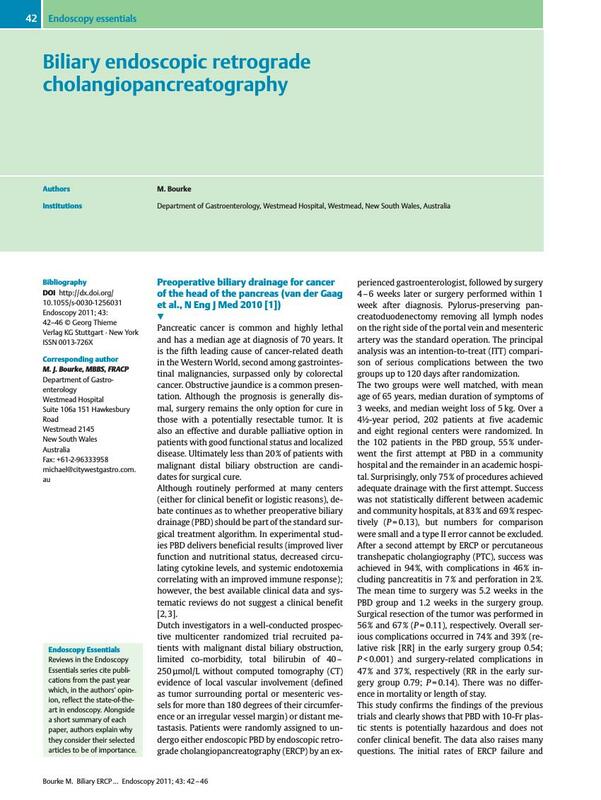 Although routinely performed at many centers (either for clinical benefit or logistic reasons), debate continues as to whether preoperative biliary drainage (PBD) should be part of the standard surgical treatment algorithm. In experimental studies PBD delivers beneficial results (improved liver function and nutritional status, decreased circulating cytokine levels, and systemic endotoxemia correlating with an improved immune response); however, the best available clinical data and systematic reviews do not suggest a clinical benefit  . Dutch investigators in a well-conducted prospective multicenter randomized trial recruited patients with malignant distal biliary obstruction, limited co-morbidity, total bilirubin of 40 – 250 µmol/L without computed tomography (CT) evidence of local vascular involvement (defined as tumor surrounding portal or mesenteric vessels for more than 180 degrees of their circumference or an irregular vessel margin) or distant metastasis. Patients were randomly assigned to undergo either endoscopic PBD by endoscopic retrograde cholangiopancreatography (ERCP) by an experienced gastroenterologist, followed by surgery 4 – 6 weeks later or surgery performed within 1 week after diagnosis. Pylorus-preserving pancreatoduodenectomy removing all lymph nodes on the right side of the portal vein and mesenteric artery was the standard operation. The principal analysis was an intention-to-treat (ITT) comparison of serious complications between the two groups up to 120 days after randomization. The two groups were well matched, with mean age of 65 years, median duration of symptoms of 3 weeks, and median weight loss of 5 kg. Over a 4œ-year period, 202 patients at five academic and eight regional centers were randomized. In the 102 patients in the PBD group, 55 % underwent the first attempt at PBD in a community hospital and the remainder in an academic hospital. Surprisingly, only 75 % of procedures achieved adequate drainage with the first attempt. Success was not statistically different between academic and community hospitals, at 83 % and 69 % respectively (P = 0.13), but numbers for comparison were small and a type II error cannot be excluded. After a second attempt by ERCP or percutaneous transhepatic cholangiography (PTC), success was achieved in 94 %, with complications in 46 % including pancreatitis in 7 % and perforation in 2 %. The mean time to surgery was 5.2 weeks in the PBD group and 1.2 weeks in the surgery group. Surgical resection of the tumor was performed in 56 % and 67 % (P = 0.11), respectively. Overall serious complications occurred in 74 % and 39 % (relative risk [RR] in the early surgery group 0.54; P < 0.001) and surgery-related complications in 47 % and 37 %, respectively (RR in the early surgery group 0.79; P = 0.14). There was no difference in mortality or length of stay. This study confirms the findings of the previous trials and clearly shows that PBD with 10-Fr plastic stents is potentially hazardous and does not confer clinical benefit. The data also raises many questions. The initial rates of ERCP failure and complication at 25 % and more than 40 %, respectively, are much greater than most referral centers would report or accept (< 5 % for ERCP success and < 10 % for complications would be reasonable), but perhaps these figures reflect real-world practice, particularly given that 55 % of initial ERCPs were carried out in community hospitals. Should these patients first be referred for work-up and definitive treatment to tertiary centers? It is now accepted that surgical outcomes for pancreatic resection are superior at experienced high-volume centers . Another consideration is the optimal duration of PBD. This has not yet been established. A period of 4 – 6 weeks is believed to be necessary for the restoration of the normal major synthetic and clearance functions of the liver, but as time elapses the likelihood of stent occlusion and cholangitis with a plastic endoprosthesis in malignant obstruction increases. In this study cholangitis occurred in 26 % of the PBD group and stent exchange was necessary in 30 % overall. A shorter period of PBD may ameliorate the frequency of stent occlusion and cholangitis; however randomized studies of PBD for mean periods of 7 – 18 days have failed to show a benefit . Few centers are currently capable of offering a Whipple resection within 1 week of diagnosis. Recently there has been interest in self-expanding metal stents (SEMS) more closely adapted to stricture length for PBD in surgical candidates. Such shorter stents do not compromise surgical outcomes. Several level 1 randomized trials confirm their clear superiority in the palliative setting . The advent of neoadjuvant chemoradiotherapy used to down stage  potentially unresectable disease or possibly improve the potential for cure in early disease mandates safe minimally invasive and reliable biliary drainage. Furthermore if radiologically silent metastatic disease or an unresectable tumor is found at surgery then bypass surgery is not required as definitive palliation has already been achieved. Thus future studies in this area should examine the role of SEMS as a bridge to surgery.